There’s a song in the musical Man of LaMancha that goes “Why does he do the things he does? Why does he do these things?” Sometimes I sing this to myself as I move from hive to hive, but somehow it becomes “Why do I do the things I do…”. The answer to WHY I do the things I do is the driving force in both my beekeeping and my honey sales. 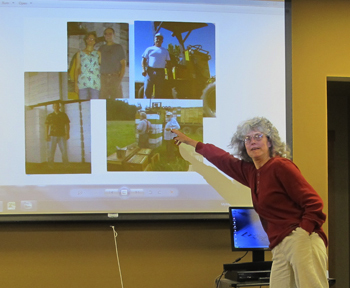 Hopefully, I imparted this to the Skagit Valley Beekeepers Association when I was the speaker last week. My topic: A bit about how I keep bees and Marketing. Marketing doesn’t grip the soul and imagination the way beekeeping does. But without it, beekeepers don’t have sales and without sales the beekeepers can’t make a living, without the beekeepers the majority of honeybees here in the US (where there are no native honeybees) wont survive. Marketing is important to both the beekeepers and the bees. Why one does what one does is the primary aspect of marketing. If I didn’t love keeping bees and knowing about bees and honey, then I wouldn’t be very good at selling my honey and the honey of other independent Washington state beekeepers (PacificNorthwestHoney.com). Beekeeping is great: it’s science, nature, art, planning, and just plain luck all rolled into one. The relatively short lives of honeybees allow me to see changes in multiple generations. The on-going search for keeping the little darlings alive allows for new experiments and innovations. The ability to raise ones own queens allows me to manipulate those generations to help my honeybees survive better. It’s challenging, fun, and, yes, at times depressing when things don’t work out. Selling my own raw honey and brokering raw honey is fun too. I wanted to give folks the opportunity to taste different honeys that are produced in Washington state. Often people think honey, is honey, is honey. But honey can taste different from hives two miles apart. Each area has its own unique styles of honey, and these can change from year to year depending on weather and flower blooms. The honeys we sell come from all parts of Washington: from the northwest, to the southern border to the northeast corner. Each is remarkably different. Each is delicious. Plus I get to meet other beekeepers who are always really interesting people. I also wanted my customers to know the source their honey and to “meet” the beekeepers whose hard work has resulted in the delicious honey. Sourcing the honey was easy : Each jar of raw honey, infused raw honey, and raw honey infused organic vinegar we sell has the name and location of the apiary that produced the honey on the label. This is not the norm in our area. “Meeting” the beekeepers in person was not really functional, but this is the Internet age and that offered me a way to introduce the beekeepers. 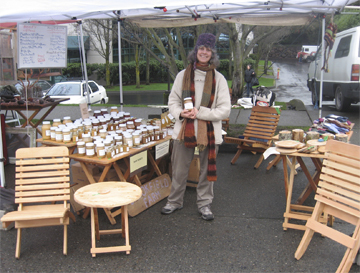 Each honey we sell has it’s own page at both PacificNorthwestHoney.com and at Walking-Wild.com (our farm site). The pages describe both the honey and share a bit about the beekeeper. At market, I simply talk about the beekeepers. This winter I’m going to set up QR codes for each beekeeper’s page. The exploration of the diversity of honeys leads in conversation to the exploration of nature. Topics at our honey booth can range from how the bees structure their lives to the current state of bee health to the wonderful world of plants and flowers that produce the honey, pollen, and propolis. I really enjoy helping others to explore nature. Bees and honey, photography, video productions, writing, and just walking for weeks on end : I’ve been lucky to experience and share nature in my work throughout my life. How I do what I do, came from why I did it. It’s the logical progression. It also drives marketing from our logo (a drawing by a friend’s son) to our webpages to our market booth; everything reflects who we are and our love for nature, simplicity, and beekeeping. I really do believe “Why” is the basis of marketing. Barcodes. QR Codes. Blogs. Twitter. Facebook. Farmers’ Markets. Wholesale Accounts. And many more tasks that make up selling. There’s too many to write of here. And, as I’m always discovering, they can seem too many to keep up with – before posting this I had to fix two of the above pages (I’d rather be with the bees). Bees build a foundation before they expand their comb. Just like them, marketing needs a firm foundation and that is WHY we do what we do. Our love of what we do and the reasons that brought us to beekeeping attract customers and also keep us committed to the bees. 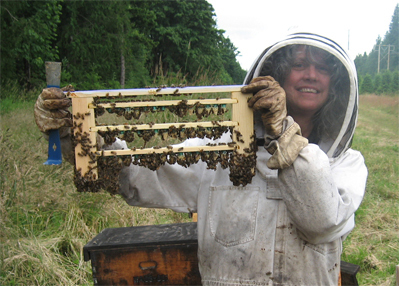 Why did you take up beekeeping? Where has it led you? 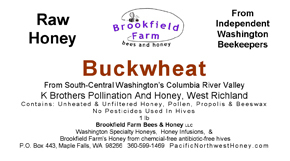 This entry was posted in Marketing and tagged beekeeper, beekeepers, Brookfield Farm Bees and Honey, honey, Karen E. Bean, Maple Falls, Marketing, Skagit Valley, spaker, Washington, why. Bookmark the permalink.